Starting a new job, writing papers for the classes I’m presenting at AU, coupled with creating some exciting content as this year’s AU Virtual host has left very little time for blogging (in case you hadn’t noticed). Despite my rather chaotic schedule of late; my new position with CADD Microsystems has been incredible, and my part as the AU Virtual Host gets more and more exciting as we (Autodesk and I) work to finalize my on-site conference schedule. I don’t have any juicy details to share quite yet, but let’s just leave it at this – IMHO even those attending AU in Vegas will want to tune into some of the exclusive content being produced for AU Virtual. So enough about all the things that’s been keeping me busy, let’s talk CAD! Fields have been around in AutoCAD for some time, and their versatility never ceases to amaze me. Thanks to one of my new coworkers I came across what I thought was a pretty ingenious use of fields to help keep your titleblock information accurate. Using fields it’s possible to link the scale text within your titleblock (or detail callout for that matter) with your viewport. That means with this simple, yet effective tip, you’ll never have to worry about updating your scale callouts since AutoCAD will do it for you automagically. First things first, be sure to set the scale of your viewport to something representative of your design. Next I’ll just insert a field into my drawing. I can choose to do this within a piece of MTEXT (Contextual Text Editor Ribbon tab > Insert panel > Field), or inside a Block Attribute (right-click > Insert Field). Either way, you’ll come to the Field dialog. The versatility of Fields lends itself to the long list of options available to you within the Fields dialog; do yourself a favor and change the Field Category to Objects. 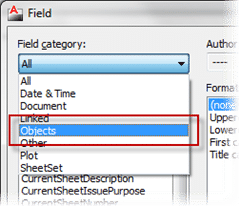 After using the Field Category to filter the list of Fields down to a more manageable list; click on Object  inside the Field Names list, and then click the Select Object  button next to Object Type. Select the edge of your viewport, and press enter to return to the Field dialog which is now populated with information about the viewport you selected. From the Property list, choose Custom Scale. This will give you several options about how to display the scale. In this example I’ll select the Use Scale Name option to have AutoCAD pull the scale name from the name of my Annotation Scale. Click OK once you’ve selected the option that works best for you.This will insert a field into your block attribute or block of MTEXT that reports your viewport scale. Since the field is dynamically tied to the selected viewport, changing the viewport scale will automatically update the text contained within the field. If the field doesn’t update as soon as the viewport scale is changed, just do a quick REGEN. Have a novel use for fields inside AutoCAD? Share it in the comments of this post! WOULD THSIS STILL WORK IF IT’S IN THE XREFERENCE DRAWING? We have been doing this since fields came out! It was the first things that occurred to me that they would be useful for. We also use fields for a custom plot stamp on every drawing.